Serrated Hill is shown above, viewed from the southeast, looking northwest. The hill, as viewed, is about 1.5 km long, with a maximum elevation 240 m above sea level. The highest part of the hill stands about 150 m above the bottom of the foreground valley. 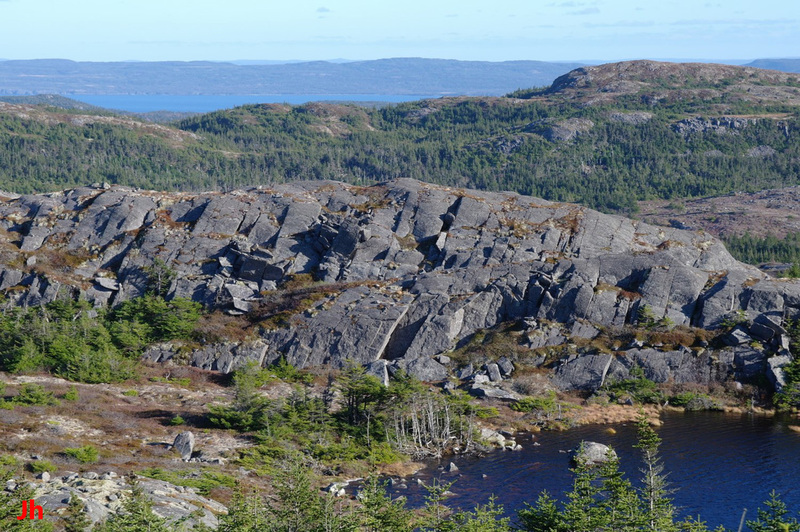 This feature is an antiform comprised of volcanic rock, uplifted and metamorphosed by tectonic compression during the Acadian orogeny. As can be seen in the photo, the feature is divided into a series of ascending ridges. There are steep, deep valleys between the ridges. A less-well defined set of descending ridges is present on the back (northwest) side of the hill. The ridges seen above are the result of glacier flow (ice flow left to right as seen in the photo) interacting with well-developed tectonic planes of weakness in the bedrock. 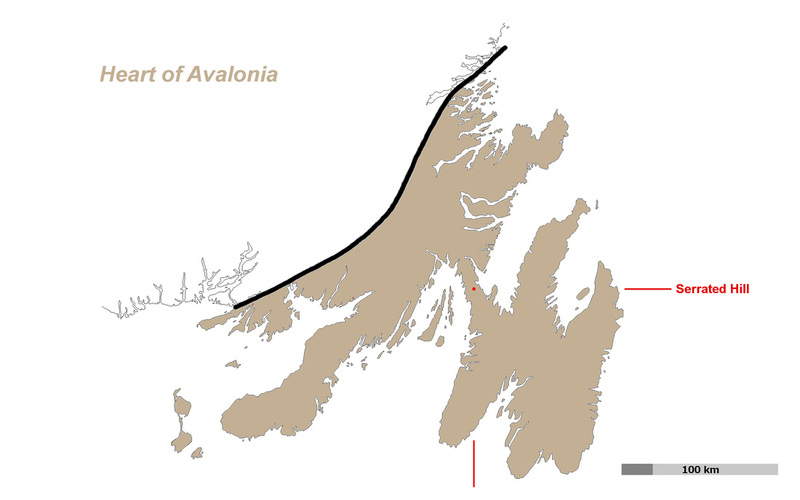 The Serrated Hill landform is located on the isthmus of Avalon as shown (red dot) on the left map. The airphoto on the right shows Serrated Hill in the white box. The box is slanted, pointing 17 deg. E of N, corresponding to the approximate strike of the tops of the highest ridges. The ridges can be seen most plainly at the top left corner of the box. This area has the highest elevations in the region. The photo at the left shows a view directed east, looking down across the ridges, while the right-hand photo shows a west directed view, looking up. 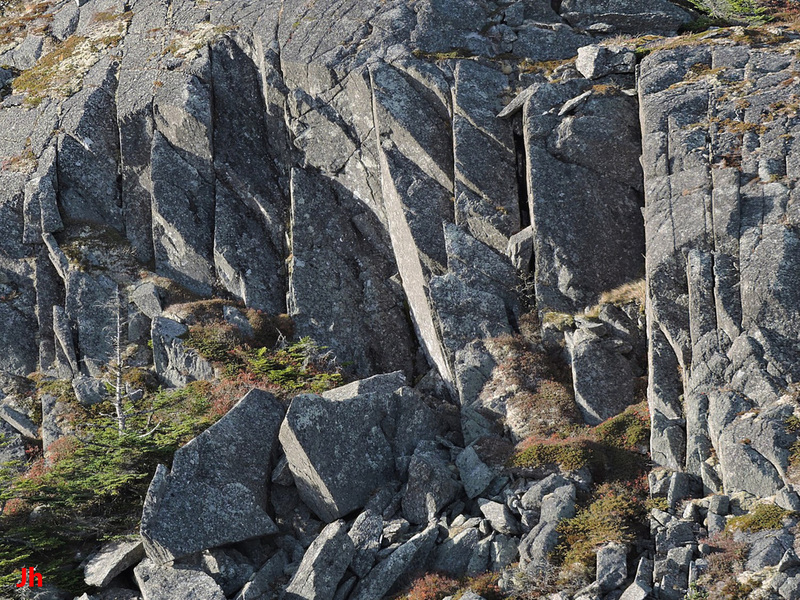 The ridges are asymmetric, flat-sloping and smooth on the east side and broken and irregular on the west side. Both of the pictures above look approximately 20 deg. east of north. A larger asymmetric valley is shown on the left and a smaller asymmetric gulch (about 3 m wide at the bottom) is shown on the right. These views are directed about 20 deg. W of S, almost along the strike of the ridge system. 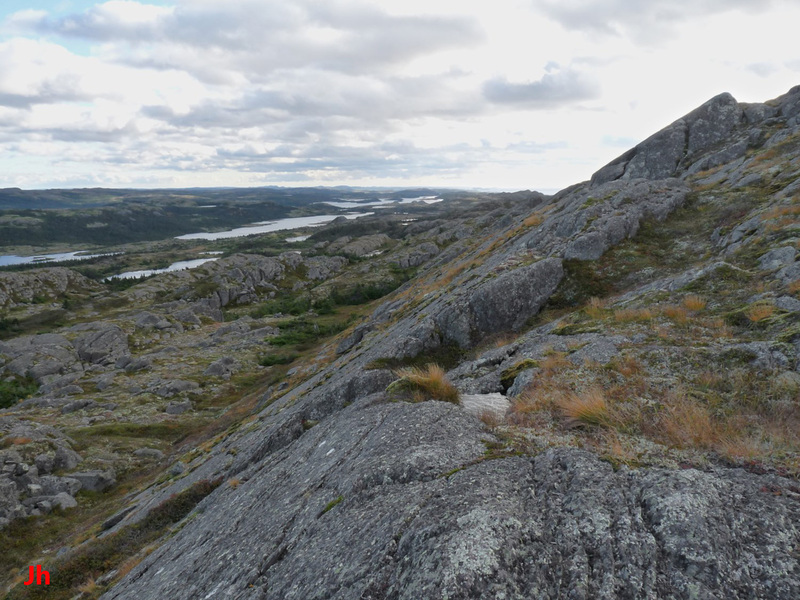 A string of lakes visible in the background of the left photo runs along the bottom of a synform paralleling the Serrated Hill antiform. 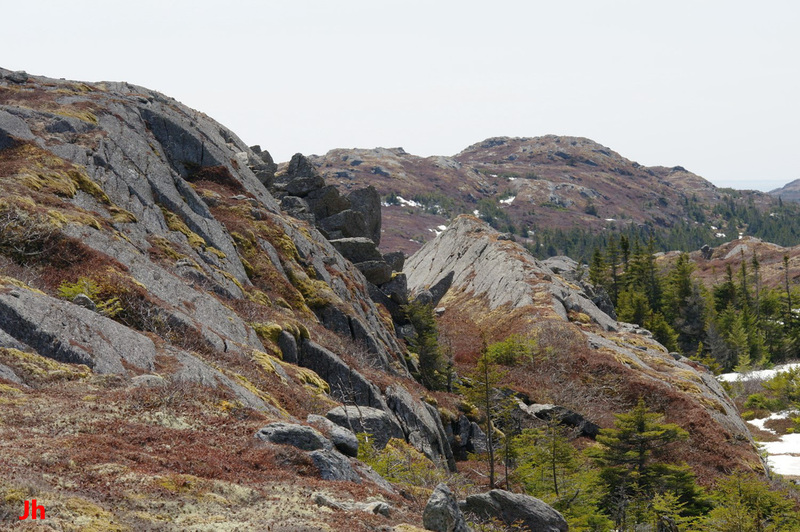 The elongated, rounded rock slabs in the foreground of the right picture strike parallel to the ridges. The above south-looking pictures show smaller ice-carved ridges, such as are frequently embedded within the larger ridge system. Three ice-cleaved flat surfaces on the southeast faces of different ridges are illustrated above. 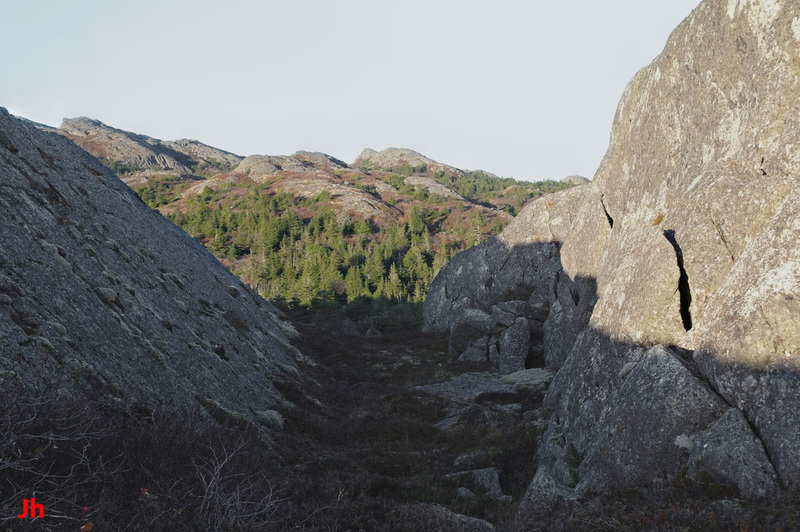 The large sloping rock face shown on the left is about 30 m high, while the other two slopes are each about 6 m top to bottom. 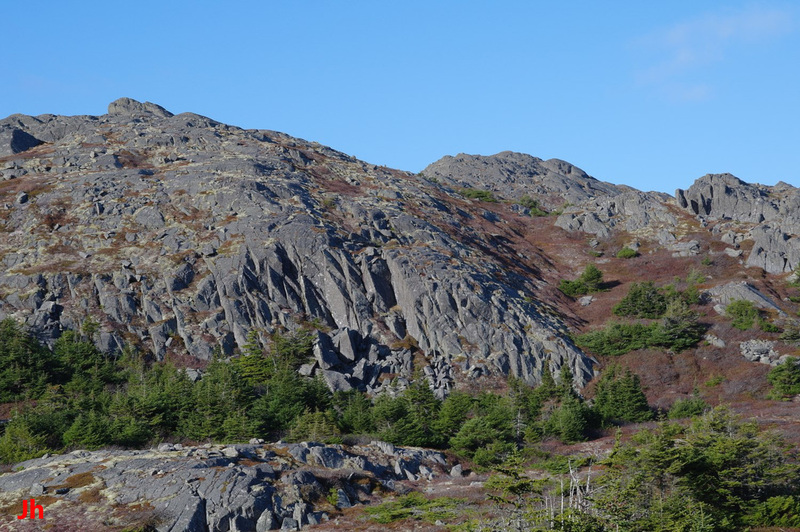 Cleavage and associated jointing in the rocks comprising Serrated Hill guided the development of the prominent ridges that were eroded by moving ice during the last glacial period. 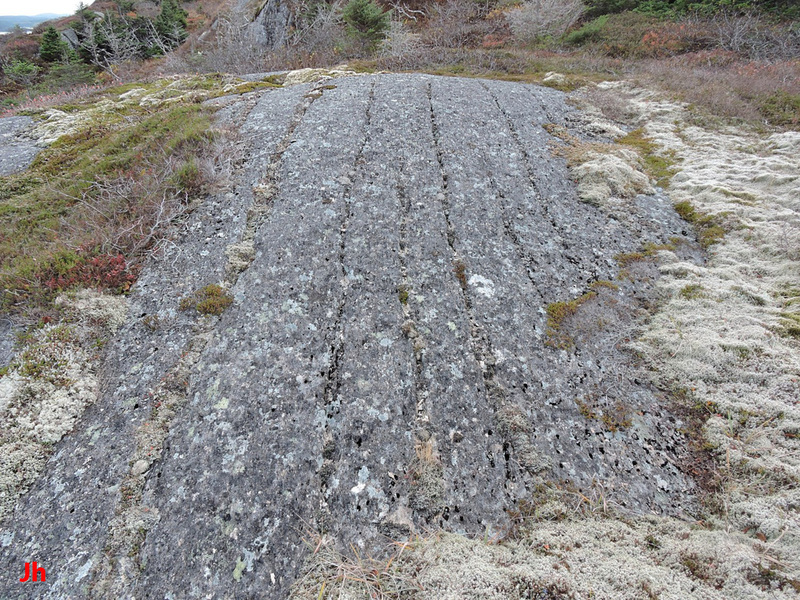 Longitudinal (parallel to the axis of the antiform) jointing in the three above-pictured rock exposures is revealed by frost weathering of the etched surfaces. In many instances, the joints are widened by frost wedging. 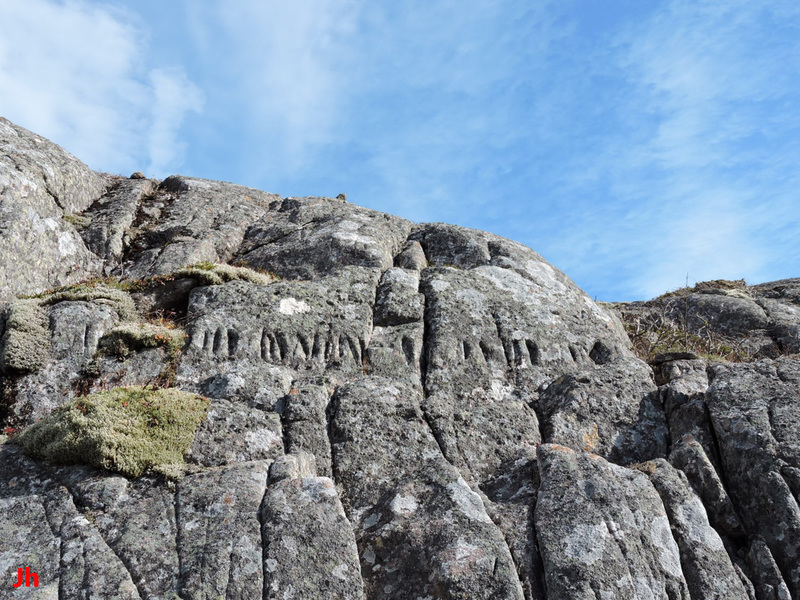 The etching, caused by a combination of rain, frost and lichen, delineates the distinct tectonic cleavage in the underlying rock. The cleavage planes and joints strike between 10 and 30 deg. E of N over the region of interest and the strike angles generally align closely with the strike angles of nearby ridge tops, valley bottoms and sloped failure planes. The dip of the cleavage is commonly about 60 degrees, directed southeast. 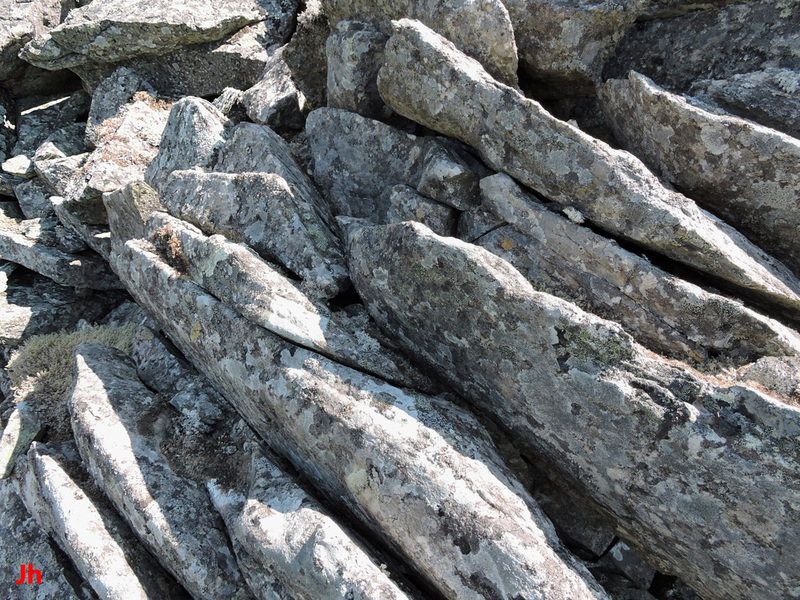 An important set of cross joints is present in the Serrated Hill rocks. The cross joints consistently appear to run at about 60 degrees to the fold axis, striking roughly either 80 deg. E of N or 40 deg. 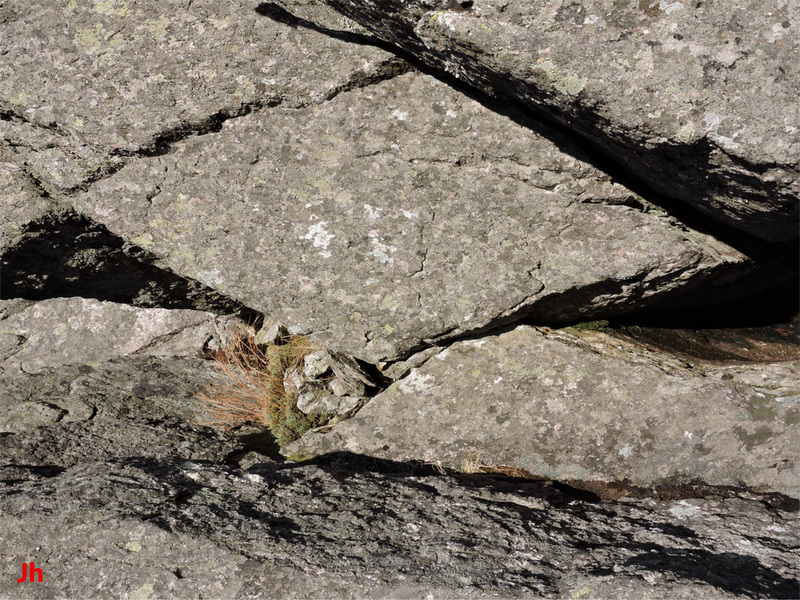 W of N. These cross joints appear in rock with distinct longitudinal cleavage and jointing, but also appear in rock with little evidence of cleavage. Cross joints are illustrated in the photos below. The top left photo, reproduced from the section (Tectonic compression) shows a ridge with a prominent cross joint set, the joints striking approximately 40 deg. W of N. A very similar pattern of cross jointing, with matching strike, appears in the more heavily weathered ridge shown bottom left. The top right photo (detail of frost-wedged failure surfaces shown lower right) demonstrates both directions of cross jointing with 60 deg.-120 deg. parallelogram-bounded joint blocks present. Some gulches, cutting obliquely across the ridges, follow planes of weakness originating in cross joints. 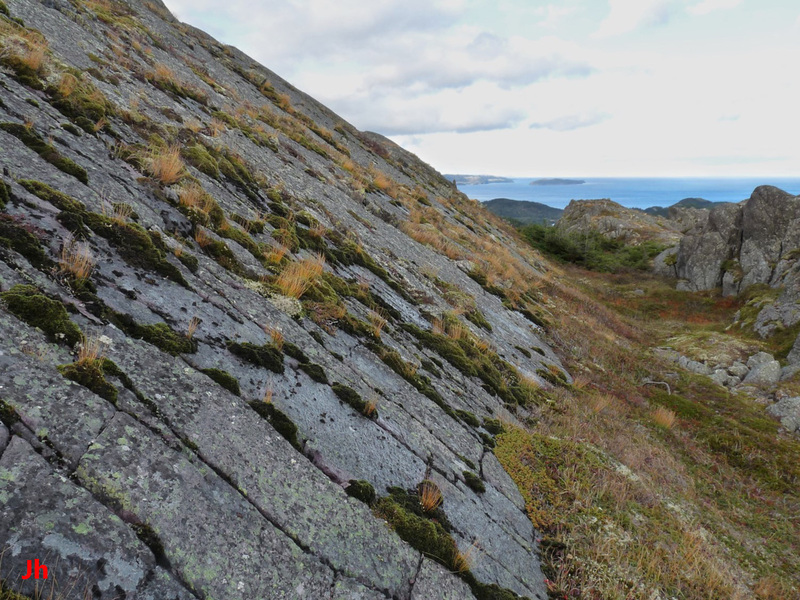 These oblique gulches are less common than the gulches between ridges because the cross jointing is not as pronounced as the longitudinal cleavage in most of the Serrated Hill rock. Furthermore, the cross joints were not as favorably aligned with ice flow direction and thus were less likely to yield failure surfaces under ice loading. 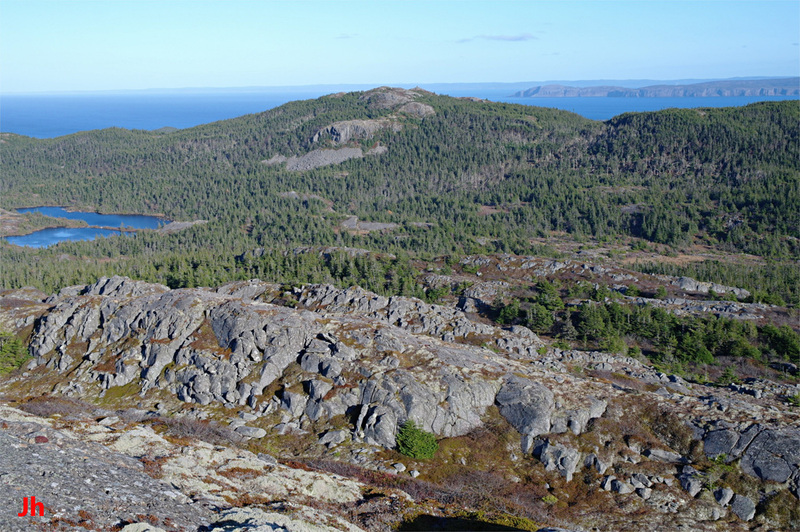 .All rocks observed on the Serrated Hill landform are subaerial volcanic in origin and belong to the Musgravetown group, Bull Arm formation. The rock is felsic for the most part and appears to consist primarily of ignimbrite and tuff, at least on the upper portions of most of the ridges. The lower portions of some of the ridges are comprised of rock crystallized directly from the melt and flowing magma has produced dykes that penetrate some of the ignimbrite in the upper parts of the ridges. It is often difficult to tell if a particular zone of rock is a flow or a tuff. Although flows can carry clasts, a diverse mix of heterogeneous clasts most likely indicates an ignimbrite. The majority of exposed bedrock and glacial till found on the Serrated Hill ridges is ignimbrite. In some volcanic areas of Heart of Avalonia, ignimbrite, when present, has largely resisted development of the strong cleavage frequently associated with regional metamorphism. In such areas, ignimbrite can stand out from adjacent rocks and be recognized precisely because cleavage is not prevalent. However, most of the ignimbrite in the Serrated Hill rocks possesses very distinct cleavage. Several explanations are possible. Firstly, there could have been enhanced compressional stress in the area and/or compressional stress accompanied by elevated temperature. Secondly, the tectonic stress could have included a significant shear component. The strike directions of the ridge tops and of the longitudinal cleavage and jointing vary with location, with the strikes becoming more easterly oriented nearer the northern end of the synform. This could imply uneven tectonic compression with consequent shear stress/strain. Shear stress is more effective than compressional stress in causing cleavage and joints/faults to develop in rocks lacking phyllosilicates. Thirdly, the ignimbrite could be rich in phyllosilicate minerals. Ignimbrite originates in a volcanic explosion and can incorporate large volumes of country rock (rock adjacent to the explosive volcanic event) that could be phyllosilicate-rich. Furthermore, ground water and steam can percolate through freshly deposited hot ignimbrite and can convert minerals such as feldspars into phyllosilicates. Metasomatism taking place long after the ignimbrite was in place could also change the composition of the rock and enrich it in phyllosilicate minerals. Two samples of ignimbrite from Serrated Hill are pictured below. The sample on the left (specimen 20 cm wide) is a slab of ignimbrite showing clast sizes, shapes and colors that are fairly typical of the rocks found on the upper portions of the Serrated Hill ridges. The sample possesses distinct cleavage parallel to the plane of the ground (hence not visible) and the surface shown is a cleavage surface. For the most part, the cleavage cuts through the clasts. The clasts are supported in a fine-grained matrix that comprises a significant fraction of the total volume. 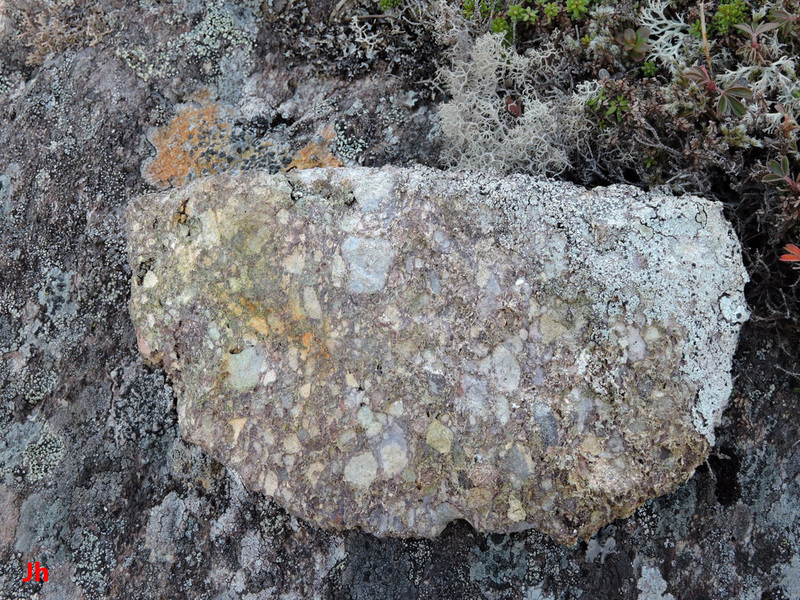 The surface shown is a weathered surface (lichen-covered rock flipped over). The sample on the right (12 cm wide) is a piece of typical Serrated Hill ignimbrite, weathered, but manually scrubbed of lichen. Sample orientation and directed lighting are optimized to show cleavage. A key question arises as to whether this is a eutaxitic ignimbrite (see section Eutaxitic ignimbrite) where part or all of the cleavage was induced by rheomorphic flow at time of deposition. This cannot be excluded without consideration, even in a landform like Serrated Hill where the widespread cleavage all shows tectonic alignment. Given that cleavage planes were initially established parallel to the ground by rheomorphic flow, the sloping tectonically aligned cleavage that is now apparent could be an artifact of the folding of the ignimbrite layers into an antiform. 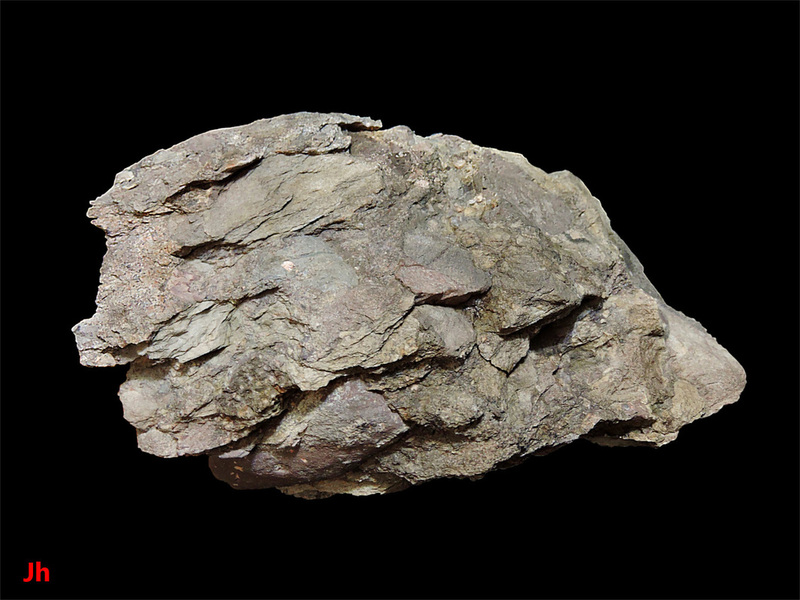 The clearest evidence that the ignimbrite cleavage is not of rheomorphic origin is that the clasts do not show the flattened shape typical of eutaxitic ignimbrite. The geomorphology of the Serrated Hill area is product of the interaction of glacial ice with anisotropic bedrock. During the most recent glacial period, ice thicknesses of the order of hundreds of meters flowed across Serrated Hill. The ice emanated from regions west or northwest of the region of interest and flowed east or northeast toward Trinity Bay. 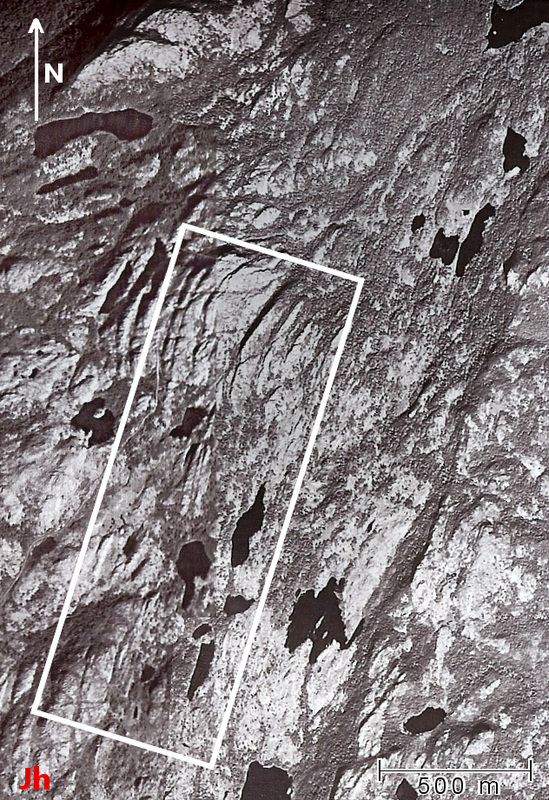 A coincidental approximate alignment of ice flow direction and the strike of cleavage planes in the underlying bedrock accounts for the long, narrow ice-carved ridges that characterize Serrated Hill. While ice pressure will break rock preferentially along planes of weakness, other factors combined to shape the resultant ridges. 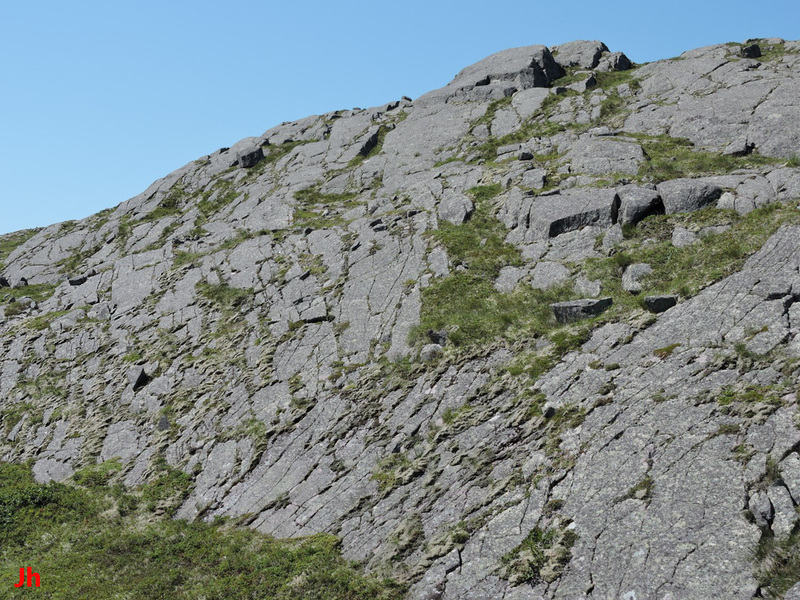 The photo on the left above shows a flat, sloping rock face (15 m top to bottom) taken edge-on to show the dip (30 degrees). 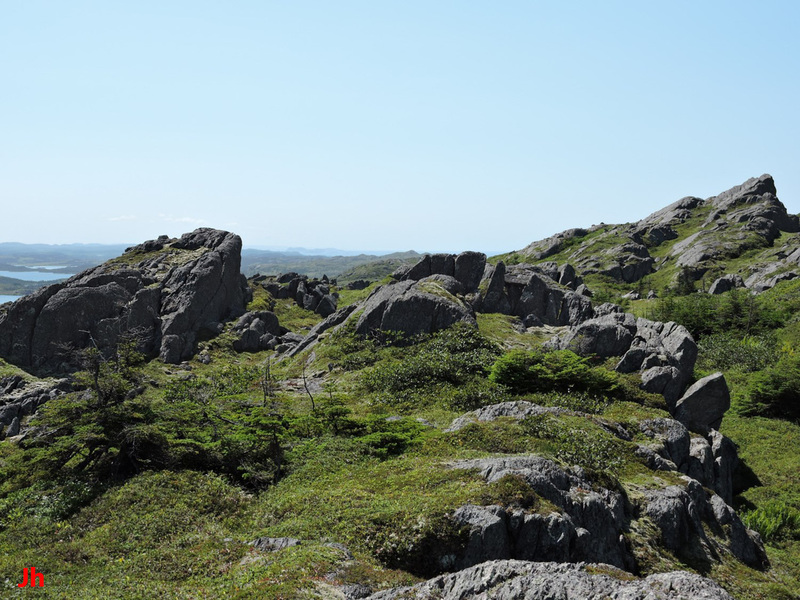 An enlarged view of the background rocks is shown right. The joints in the background rocks and the cleavage in these rocks and in the left-pictured rock face all dip at about 60 degrees. Thus, it is evident that the dip of the ice-eroded rock face does not match the dip of the underlying cleavage. 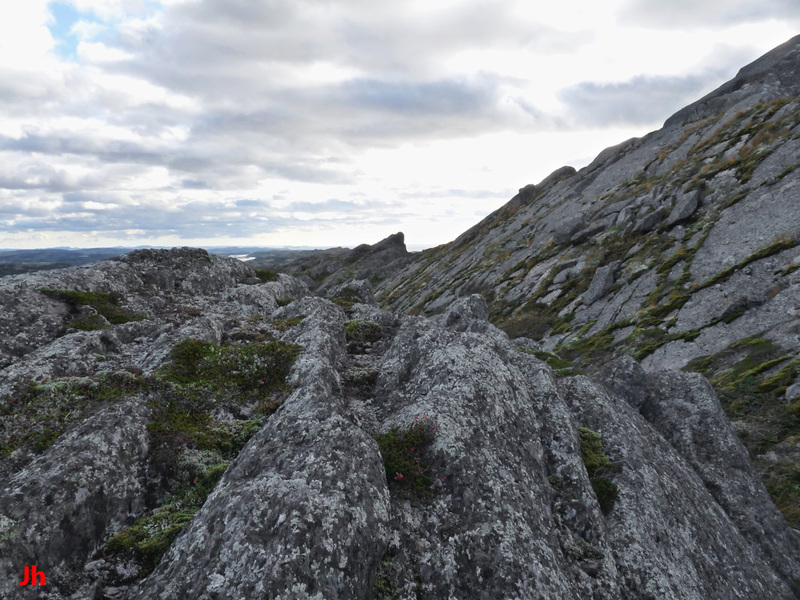 This is common in most of the southerly-dipping flat sloping rock faces on the Serrated Hill ridges. The diagram on the left illustrates how ice tended to erode an imbricated surface on bedrock possessing distinct cleavage such that the resultant average eroded surface dips at a shallower angle than the cleavage. 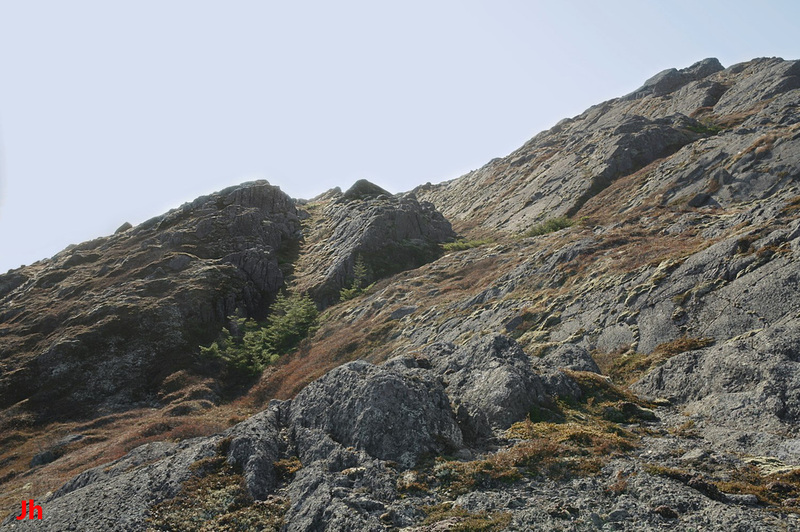 The photo on the right illustrates this type of erosion on a Serrated Hill rock face. It is clear that ice-eroded surfaces cannot match cleavage planes everywhere on a ridge since the dip of the cleavage remains uniform to the top of the ridge while the dip of the erosion surface must bend increasingly (albeit abruptly in some instances) toward the horizontal. On the back (north-facing) sides of the ridges, an erosion surface following the cleavage would tend to undercut the upper sections of bedrock, creating unstable, overhanging cliffs. 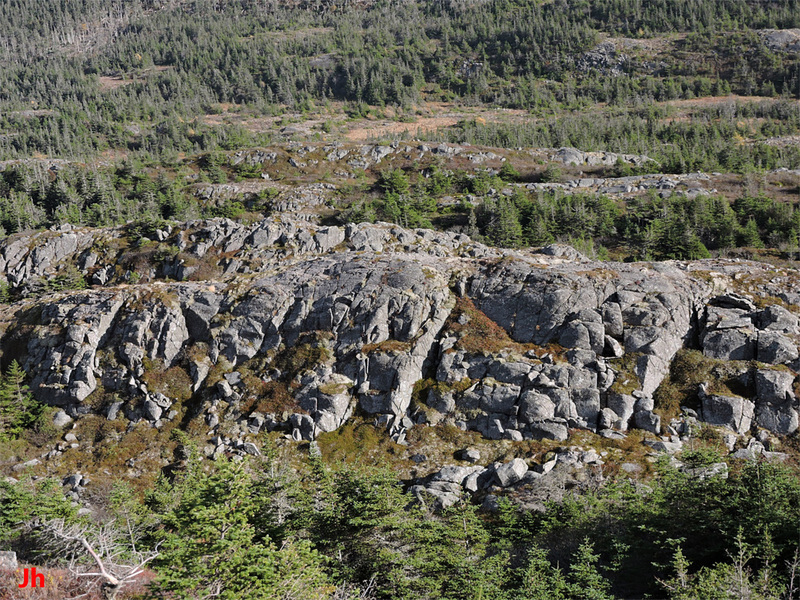 The above view emphasizes how glacial erosion occurring at shallow angles to the cleavage (left sides of features) gives way to vertical or undercut erosion surfaces at the tops of the ridges. 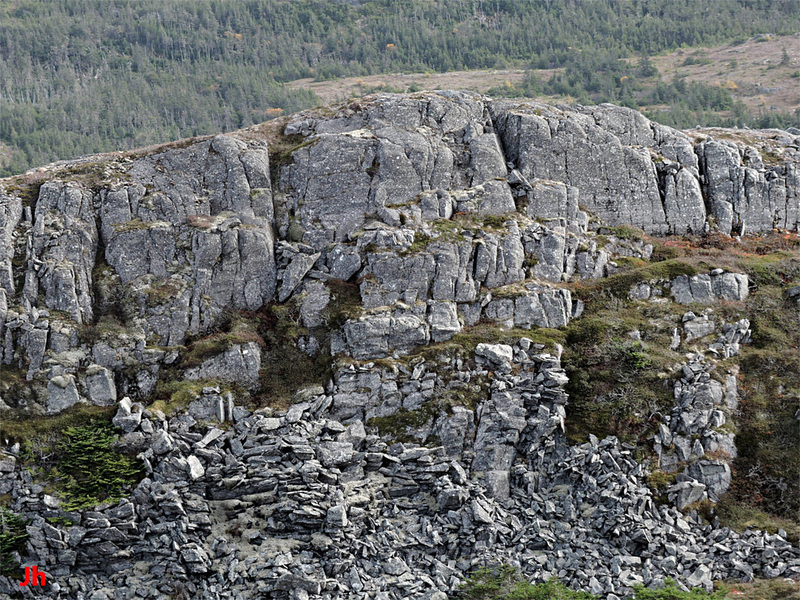 The features shown here resemble landscape features (roche moutonnee) that might result from ice moving left-to-right across the field of view, streamlining the rocks from the left and plucking rock from the right. However, in the case under consideration, this would entail ice moving almost backward, northwest against the regional trend. 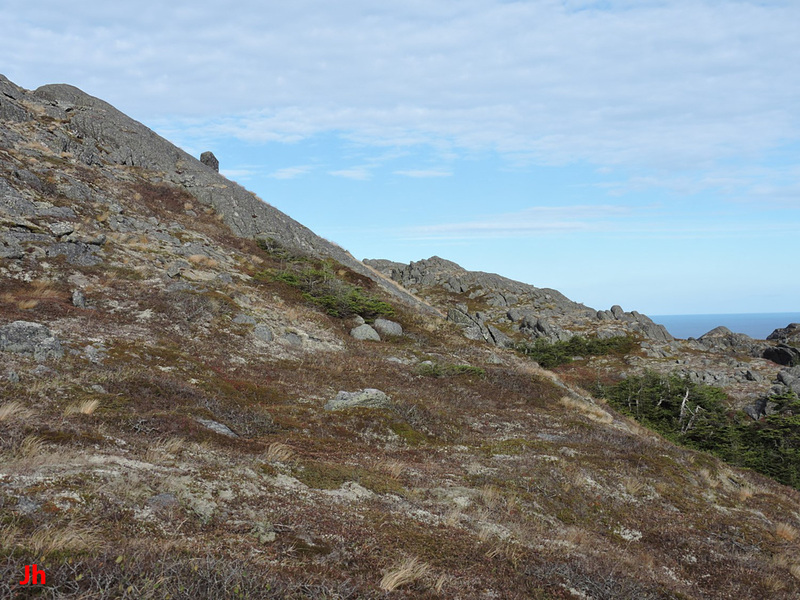 Furthermore, the multiple parallel long deep and steep valleys between the ridges, along with streamlined ridge tops and other streamlined rock outcrops all point toward ice flowing northeast toward the camera and then downward toward Bull Arm and Trinity Bay. 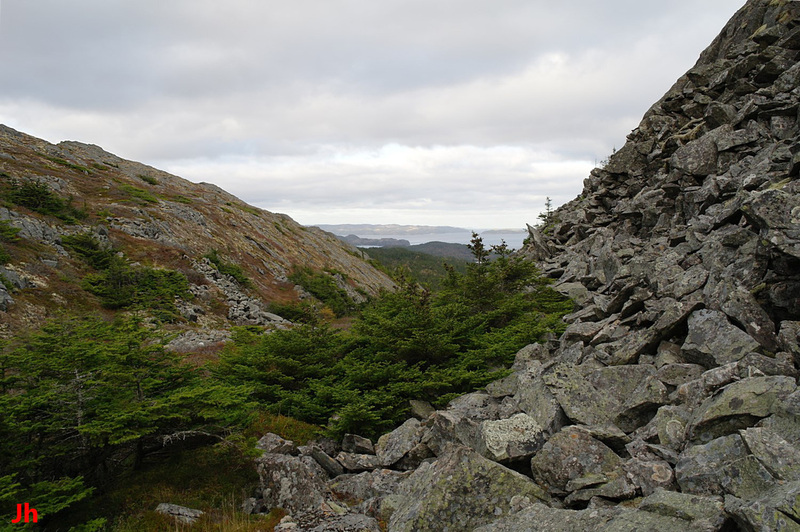 While many of the north-facing ridge slopes on Serrated Hill are dominated by large volumes of loose angular boulders fallen from unstable cliffs, in some cases, as above, ice has removed most of the loose rock and transported it to lower elevations. 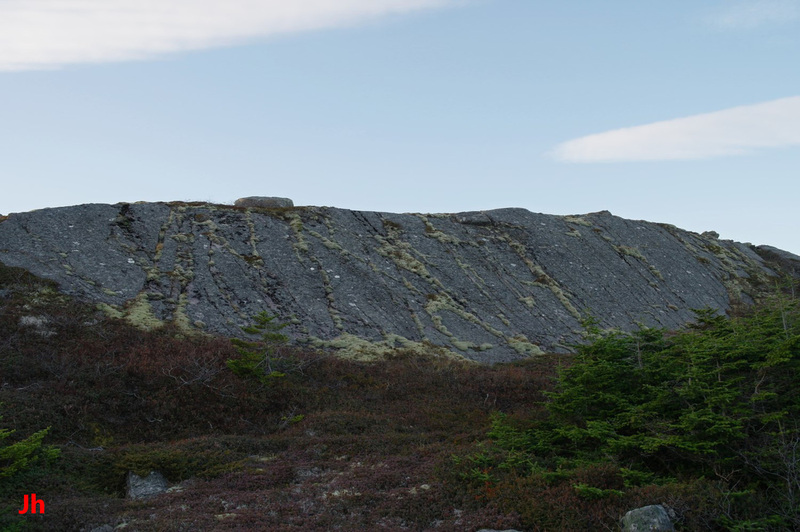 A question remains as to why the cleavage-prone rock of Serrated Hill was eroded into a series of ridges, rather than into one large, more-or-less uniform sloping surface extending from the bottom of the hill to the top. Irregularities in the pre-glacial topography of the landform would start a process of somewhat uneven glacial erosion. Then, increased ice pressure at the bottom of shallow valleys would accelerate bottom erosion and deepen those valleys, leaving less-eroded ridges between them. This kind of process, reinforced by the tendency of the rock to erode preferentially along its well defined regionally-aligned planes of weakness would explain the ridged geomorphology of Serrated Hill. 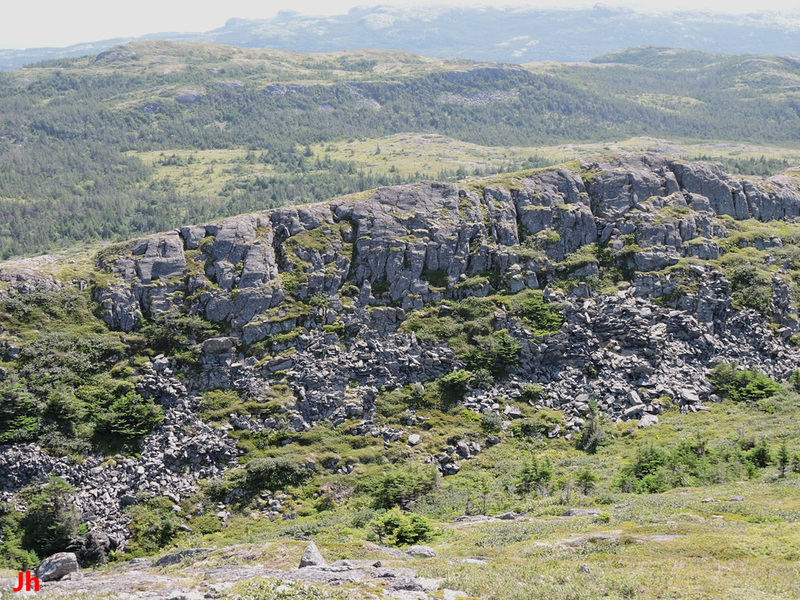 The ridge pictured above (right photo shows detail from right-hand side of left photo) provides an example where changes in joint patterns correlate with changes in the underlying geology. 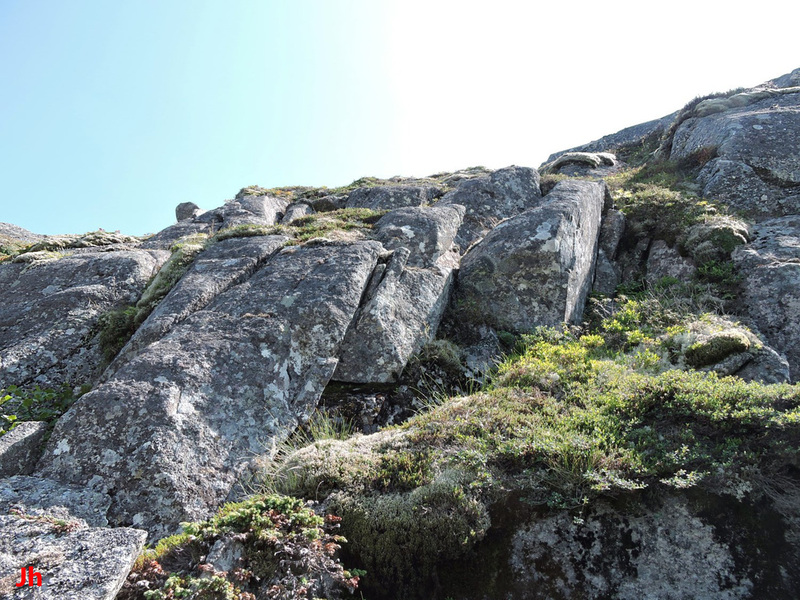 Cross jointing is dominant in the rocks comprising the upper half of the ridge while longitudinal jointing (partially concealed by frost-wedged and fallen rock) is predominant in the rocks of the lower half. 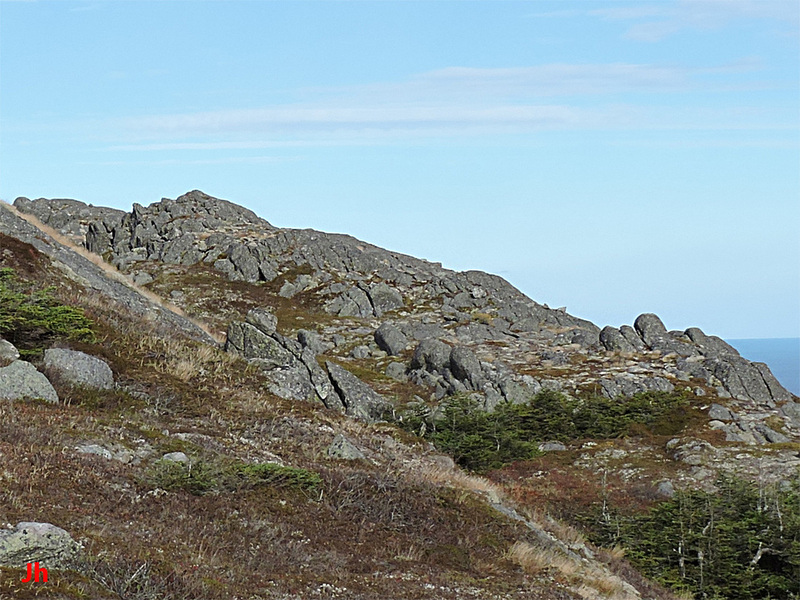 The left photo shows cross-jointed rock from the upper part of the ridge (joints strike 60 deg. to the axis of the ridge). 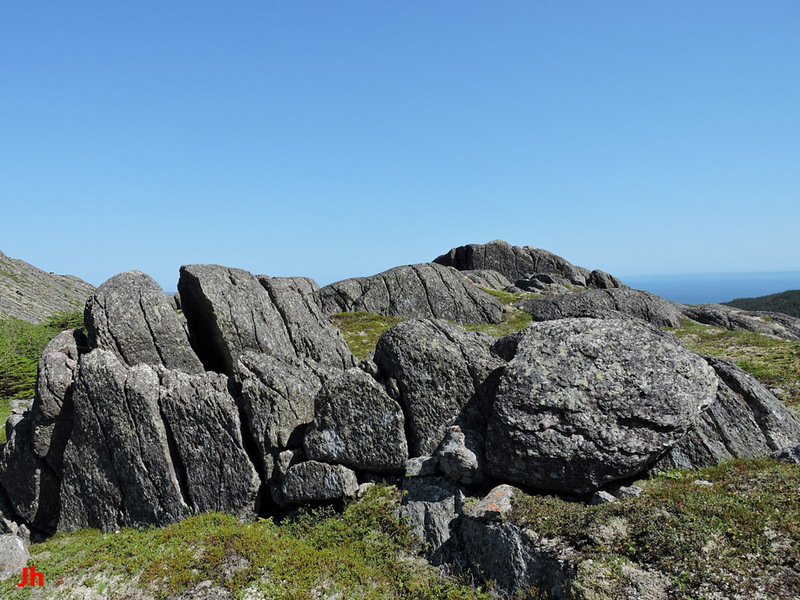 The right photo shows longitudinally jointed rock (frost wedging has tilted the rocks toward horizontal) occurring in the lower portion of the ridge. Inspection of the boundary between the two zones shows a sharp contact between different volcanic rock types. Rock does not appear to be welded together across the contact. Samples, each with dimensions about 15 cm, are shown below. The rock from above the contact (left) contains heterogeneous clasts suggesting it is an ignimbrite, while the rock from below the contact (right) is more uniformly textured and could be a tuff or a flow. 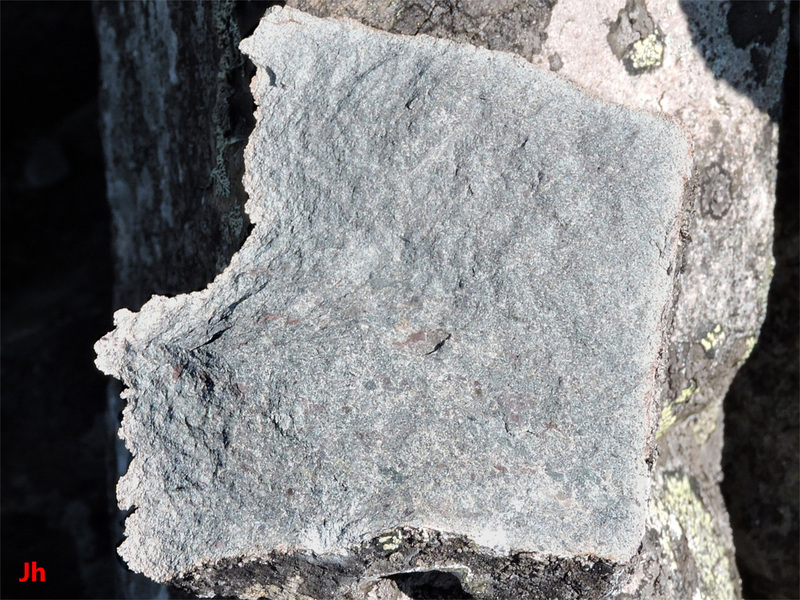 Both rocks may have been altered by varying degrees of metamorphism and metasomatism. 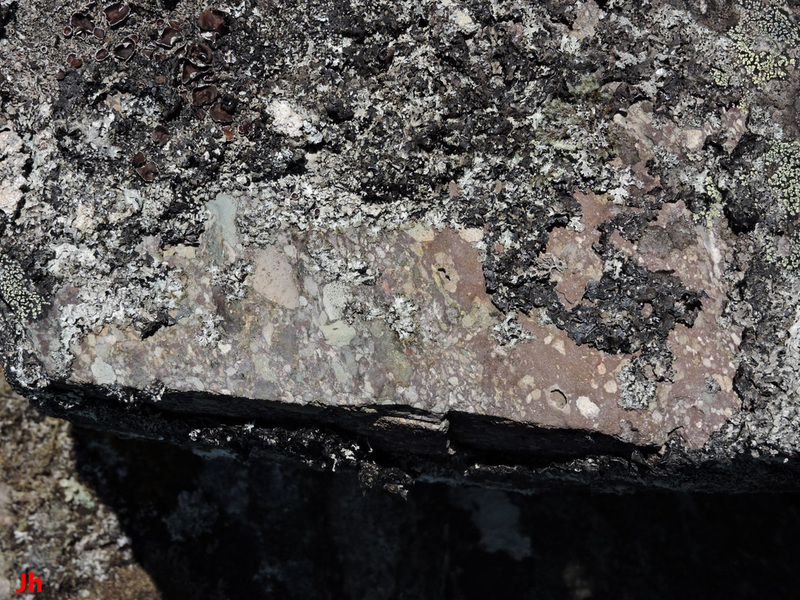 The surface shown in the left photo is weathered by rain and lichen, while the surface shown right is a freshly broken surface. The color differences between the two samples could, in part, be due to the difference in weathering. 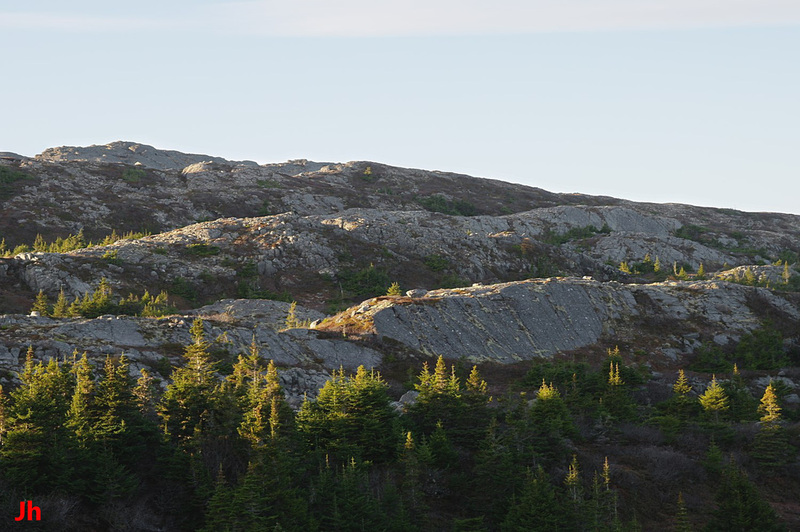 The abrupt changes in characteristics of the rock at a boundary half way down through the ridge suggest that the top and bottom portions of this rock outcrop were formed in two separate volcanic events. 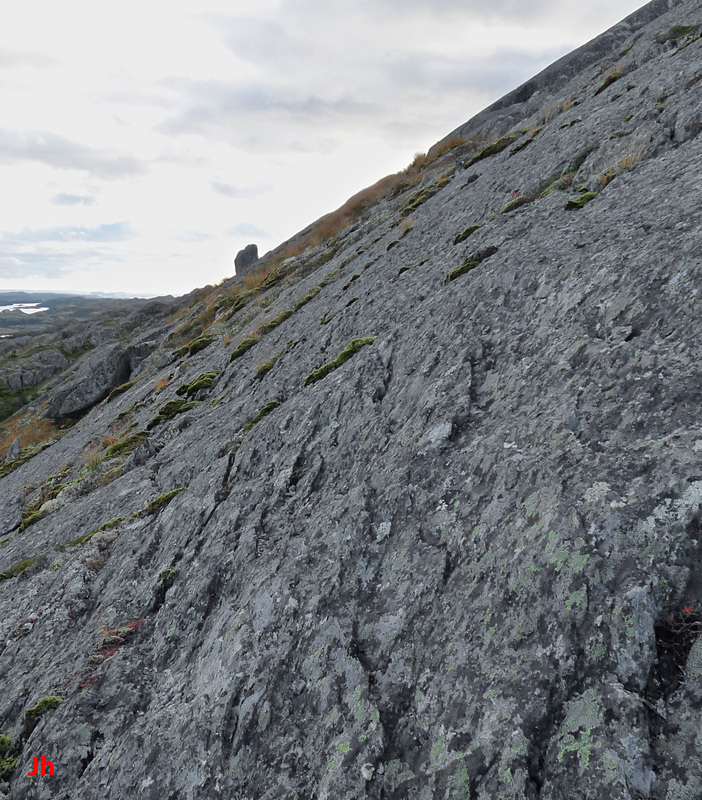 Near the top of the 2-component ridge described above, a 15 cm thick dyke has intruded the ignimbrite. The dyke would be concealed by lichen except for the readily-noticed eroded joint set in the narrow band of intruded rock (appearing just above center in the photo). These are cross joints, similar to the joint set in the host rock, but more densely spaced. 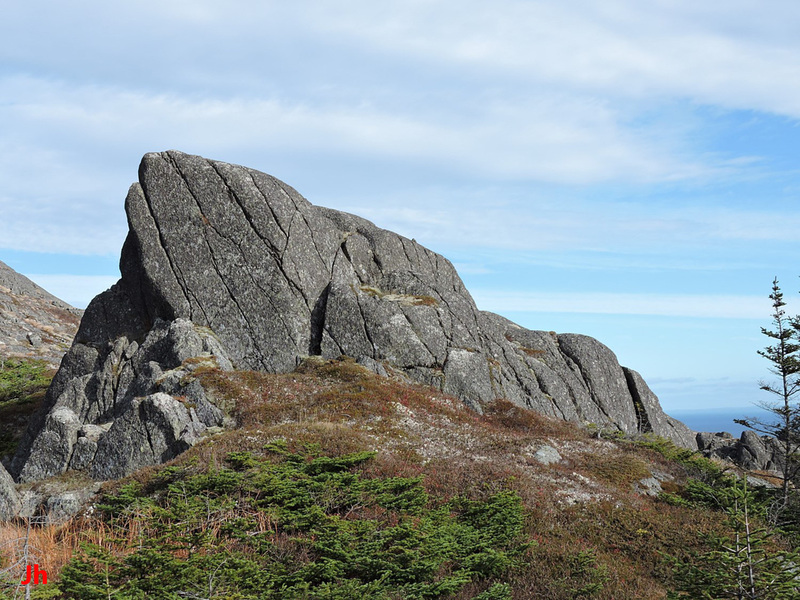 The dyke rock might have absorbed disproportionate shear strain because it was less resistant, or the dyke might have been more brittle and less fracture-inhibited to account for the increased density of joints.